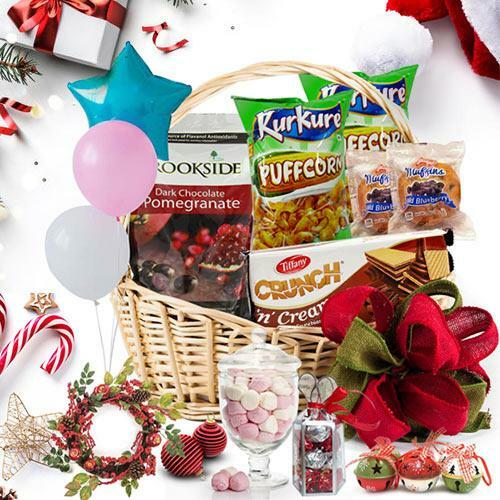 Just click and send this Taste of Christmas Love Gift Basket conveying the warmth of your love to your relatives residing far away. This Gift Basket comprises of items such as One Marshmallows (Net Wet.-160gr. ), One Handmade Chocolate (Net Wet.-100gr. ), Two Choco Waffers from Tiffany, One Brookside Pomegranate Chocolate, One Chocochip Muffin and Two Kurkure Puffcorns. All these items are decked nicely in a Small Cane Basket with Christmas Gift Accessory.